Most Richmonders are familiar with the catastrophic fire that destroyed much of the city when Confederate forces set ablaze several tobacco warehouses on April 3, 1865. 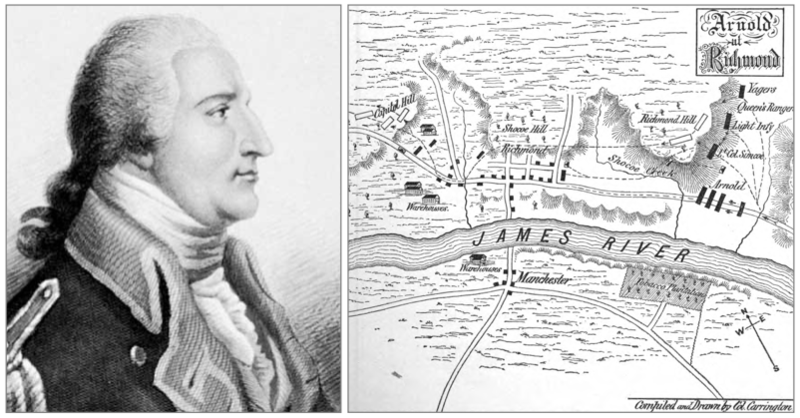 Fewer are aware that Richmond had been almost totally destroyed by fire in early January, 1781, during the Revolutionary War, by none other than the notorious Benedict Arnold. Arnold, a major general in the Continental Army, was urged to switch sides during the war by his new wife, a Loyalist named Peggy Shippen, and by his own growing feelings of resentment and anger toward George Washington. After resigning his position as the military commander of Philadelphia, Arnold was given command of West Point. Mrs. Arnold then arranged communication between Arnold and her friend, British spy master Major John Andre. In July of 1780, Arnold wrote several letters offering to turn West Point over to the British, for the sum of 21,000 pounds sterling. He began purposely neglecting the upkeep of West Point’s defenses and wasting supplies to enable British forces to more easily take the fort. Arnold met Andre on September 21, 1780, and gave him plans for West Point. Andre was caught on his way back to New York City, and was eventually hanged as a spy. The papers found on Andre proved Arnold’s treachery, and he fled to the British. One of the first actions of the new British Brigadier General Benedict Arnold was to attack Virginia. Because the British did not entirely trust him yet, he was sent with Lieutenant Colonel John Graves Simcoe and Lieutenant Colonel Thomas Dundas. On December 31, 1780, he landed with 1,600 troops. They sailed up the James River and landed at Westover Plantation on January 4, 1781. From here, they marched totally unimpeded toward Richmond. Governor Thomas Jefferson had called out the Virginia militia, but they proved to be completely unequal to Arnold’s forces and quickly retreated when Arnold approached. Arnold and his men marched into Richmond on January 5, likely following Route 5 into the city. It was claimed by her descendants that Elizabeth Ege Welsh, owner of what is now the Poe Museum, watched from her front door as Arnold’s men marched down Main Street. A Hessian soldier who accompanied Arnold, Johann Ewald, described the event in his diary, likely referring to Church Hill or Chimborazo Hill: “To the right lay a very steep hill, overgrown with brushwood, which General Arnold thought was occupied by riflemen. The general pointed there with his hand – ‘That’s a task made for you!’ I deployed at once, formed two ranks well dispersed, and climbed up the hill. The enemy left after a volley which wounded one jager [Hessian rifleman].” Simcoe and his Queen’s Rangers then marched to Westham, burned the foundry, and then returned to Richmond. Arnold, meanwhile, made himself comfortable at the City Tavern, on the northwest corner of 19th and East Main streets. His men were sent to Saint John’s Church to set up camp, in and around the church building. By this time, the weak colonial forces that had gathered on Church Hill had fled – along with Thomas Jefferson and most of the government, who had quickly removed to Charlottesville. From Richmond, Arnold sent Jefferson a letter offering to keep Richmond safe in exchange for all of the city’s tobacco and other stores. Jefferson angrily refused, and Arnold then laid waste to Richmond by setting it ablaze on January 6. Although it had been the capital for about two years, Richmond was little more than a village in 1781. Almost all of the buildings were wooden. This combined with strong winds guaranteed almost complete destruction of the town. From Richmond, Arnold’s forces attacked Chesterfield Courthouse, burning and looting outlying homes on the way. The attack on Virginia, however, eventually backfired for the British. Arnold was replaced by Lord Cornwallis in May of 1781. Cornwallis chose to ignore Arnold’s parting advice not to set up a base too near the coast. Cornwallis ended up in Yorktown, and boxed in by American and French forces, was forced to surrender on October 19, 1781. On my mother’s side of the family going way back, we are related to BA. Very nice work! Mike Gorman, Richmond.